Heartwood » Blog Archive » Who cares? Congratulations on the show. Your booth is spectacular. I love those pieces and I can just imagine there were a lot of appreciative guest running their hands along those gentle curves. Outstanding! I agree. I have completed my Box 1 project and sold it to a guy a work. I has been on my desk at work for a few weeks. Many of my colleges have stopped by and it’s interesting to watch them as the pick it up, caress it and see the details of the simple construction. I am one of those people who would stop by your booth and caress your curves. Best of luck that some of these lookers will be buyers so that we all may continue our craft into art journey. Thanks for the comments. Hey, and just to be clear, we’re talking about the curves on the furniture, okay. Haha. Glad you posted this. Sometimes when I am working out a problem on a project, I wonder if anyone will really care if it isn’t just perfect. I’ll keep trying to make it so. Or at least up to the standard that you want. Great post. I especially like the idea of experiencing a “quiet joy” from our work. The work you displayed in your booth looks to be outstanding! I hope that the show went well for you. Thanks, Mark. That phrase of Krenov’s, “quiet joy,” from the Afterword of With Wakened Hands, is one of my favorites. 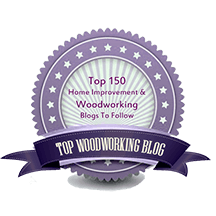 Your post brought a question to my mind – one that may have been asked and answered a hundred times already – I wonder if this “Who Cares?” phenomenon is caused or simply exacerbated by the fact that our woodworking pursuits tend to be a solitary activity? While no where near the skill level you are, it’s nice to know this condition exists across a spectrum of skill sets. Thanks for committing the feeling to words. nicely said and great looking booth. Yes, I agree, the isolation is part of it, but I guess the same question sometimes occurs to anyone trying to do a good job at something that isn’t easy. Thanks very much. And congratulations on the book!! I don’t make furniture for a living, so maybe that’s makes a difference, but I just try to satisfy (dare I say delight) myself. I think I would become schizo if I tried to imagine other people’s reactions and desires as I went along. I wouldn’t know which way to go. Yea, Sean, I see what you’re saying. I wouldn’t say I work while anticipating other people’s reaction to the finished piece. It more like this: I’ve got to have a belief in the goodness of the fundamental design and construction concepts of the piece. That compels me to want to make it. From there, it’s about trusting that it matters enough to me to do it well, and there will also be at least a few people who will also appreciate it when it’s done. Yea, it’s got to be right with me first. Thanks for the thoughtful comment, Sean. 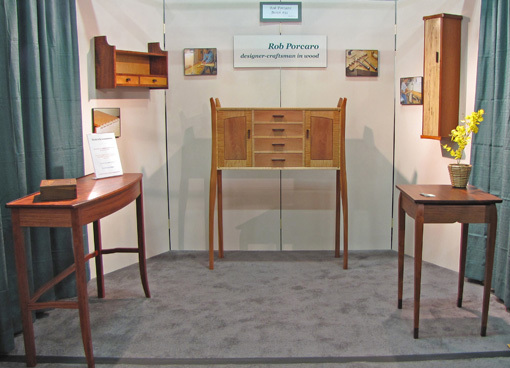 Rob, great post and your booth, plus the contents, are outstanding. I believe we who do any craft are or own worst crtics to begin with, so if anyone should care, it should be the person who did the work. For the fact that we are reading your post shows “we care” Kepp up the great work. Rick, thanks for the comment, and thanks for reading. I just visited your site to read the last installment (10) of drawer series. I hadn’t been there since mid or early September. I missed that fact that you were showing in Northampton. I am really bummed I didn’t pick that up. I would have very much liked to have visited your booth. I’ll tell you who cares. I do. I love that piece you just finished. Keep up the great work. I apologize, I should have posted the information about the show earlier, especially since you’re in that neck of the woods. It would have been fun for us to talk shop out there.